One of the reasons why people are struggling with sleep issues like insomnia is the intake of caffeine, especially prior to bedtime. You may be thinking that a cup of espresso in the evening helps you to stay alert. But the after-effects would remain and disrupt your sleep cycle. Caffeine is a natural stimulant that is found in 60 over plants. Coffee beans are commonly associated with caffeine. Besides that, you’ll also find caffeine in cacao, tea, some carbonated drinks, and certain drugs. One of the main reasons people consume caffeine-loaded drinks is to stay alert or gives them a mental jolt during in the morning. Caffeine increases adrenaline and blocks of sleep-related hormones so that you feel energized. Unfortunately, you can’t cheat sleep by dosing yourself with caffeine. As the effects wear off, you’ll be overwhelmed with mental and physical fatigue that only a good night of sleep will cure. After a cup of your favorite espresso, you’ll find a burst of energy that results in focus and productivity. You feel satisfied for achieving more than you’re planning to do. But some of us also experience a heightened state of anxiety as the caffeine runs amok in our bloodstream. Caffeine can remain in your body for up to 6 hours. This continuous state of alertness, and in some cases, anxiety makes it hard to fall asleep. If you consume a cup of coffee before bedtime, you’ll face the struggle where you are physically and mentally tired, yet the chemicals in your body are keeping you awake. A clinical study published in 2013, observes the effect of caffeine when taken 6 hours, 3 hours and immediately prior to bedtime. The results conclude that taking caffeine 6 hours or lesser before bedtime causes significant disruption to the sleep cycle. Another study shows that caffeine intake reduces sleep time by an average of 2 hours. It also disrupts the deep sleep cycle of the participants. You probably wouldn’t feel the effects of caffeine when you’re younger. But as your body age, the ability to process caffeine decreases and the cons would soon outweigh the stimulating effect it offers. Caffeine does have an addicting effect and some individuals may suffer from withdrawal symptoms when trying to quit. If you can’t quit caffeine, try to keep it at a moderate serving. And that means not exceeding 250 mg of caffeine a day. Excessive intake of caffeine, especially above 500 mg daily, can lead to side effects like increased heart rate, nausea, diarrhea, and sweating. The safety of pregnant women is also at risk with caffeine overdose. 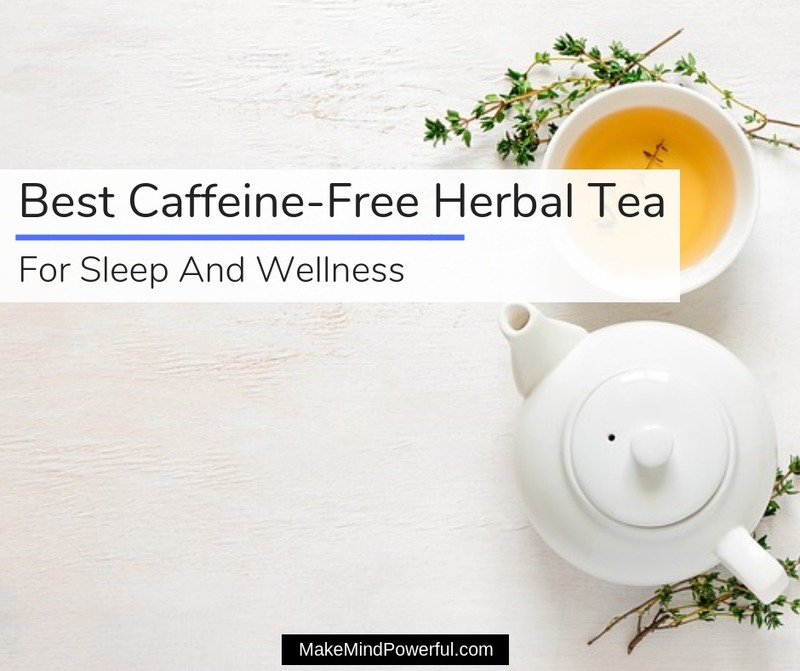 If caffeine has been causing you serious sleep issues, taking up caffeine-free tea as an alternative is a great choice. Even if you’re not giving up caffeine for good, balancing it with non-caffeinated tea offers benefit for your health. In recent days, non-caffeinated tea is a growing trend amongst health-conscious individuals. Green-tea or matcha has a loyal followings thanks to its numerous positive properties. It’s known to prevent type 2 diabetes and promote cardiovascular health. Those who struggled with insomnia has turned to teas like chamomile to calm their mind prior to bedtime. In a sense, waking up rejuvenated in the morning is much better than relying on caffeine shots to perk up. When you’re switching to tea for sleep or wellness, you’ll want to be convinced that you made the right decision. And that starts by choosing the right caffeine-free tea. Here are what to be considered when making your choice. Tea leaf – Each type of tea offers its own distinct health-boosting properties and flavor. Get one that you’re comfortable with. Loose leaves vs tea bags – Tea bags offers convenience but steeping tea from loose leaves provides a richer aroma. Single vs Blend – Some individuals prefer the full aroma of a single type of leaf but others enjoy the harmonious combination of different leaves. Organic – It’s great to have tea leaves that are grown organically and free from harmful chemicals. Trust me, you wouldn’t want to sort through every single type of tea available. There are literally tens of thousands of them in the market. Here are some of my best pick of caffeine-free tea that you could try for wellness and sleep. For thousands of years, humankind has been using chamomile for its medicinal properties. It is known to relieve anxiety and treat stomach issues. The medicinal properties of chamomile are attributed to its flavonoids and terpenoids. While there are various ways chamomile can be applied, tea infusion is arguably the most popular. Chamomile tea is one of the best herbal tea to take when you’re suffering from insomnia. A clinical study conducted by Taiwanese researchers observe the effects of chamomile tea in 80 postpartum women. 40 of the participants who take chamomile for 2 weeks experienced better sleep quality. 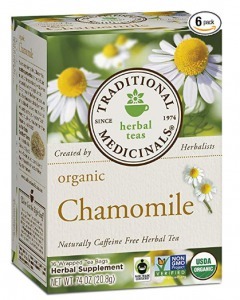 Traditional Medicinals was founded in 1974 and offer one of the finest chamomile tea available. Each of the 96 tea bags contains chamomile that is sustainably harvested from organic farms. The tea is of high-quality pharmacopeia grade and non-GMO verified. Made from only the tiny daisy-like flowers, it produces bittersweet floral taste when steeped. Taking a cup of chamomile tea before sleep helps to relax the mind and also supports your digestive health. Helps with sleep and digestive issues. Valerian root produces a strong smell that is that can be rather unpleasant for some. Despite that, it is one of the most effective natural herbs for anxiety and insomnia. The valerian plant or Valeriana officinalis is native to the Europe and parts of Asia but has been localized in North America. The medicinal properties of the valerian plant are concentrated at its root. It is believed that valerian root increases the level of GABA, a neurotransmitter that promotes mental well-being, although more studies need to be conducted for that. 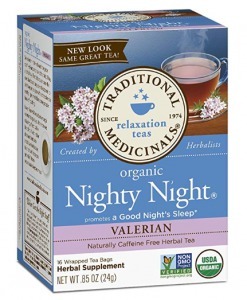 If caffeine keeps you awake, the organic valerian tea by Traditional Medicinals helps you to sleep by relaxing your mind. They are made of the roots of valerian plants that are grown organically. The tea is non-GMO certified, kosher and caffeine-free. Most individuals are put off by the taste of pure valerian root. This valerian tea includes lemon balm, passion flower, and peppermint leaf to create a minty, bittersweet taste that is more tolerable. 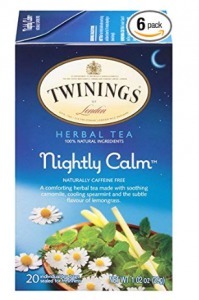 Nevertheless, it’s still a calming tea for better sleep. Made from organic herbs and plants. 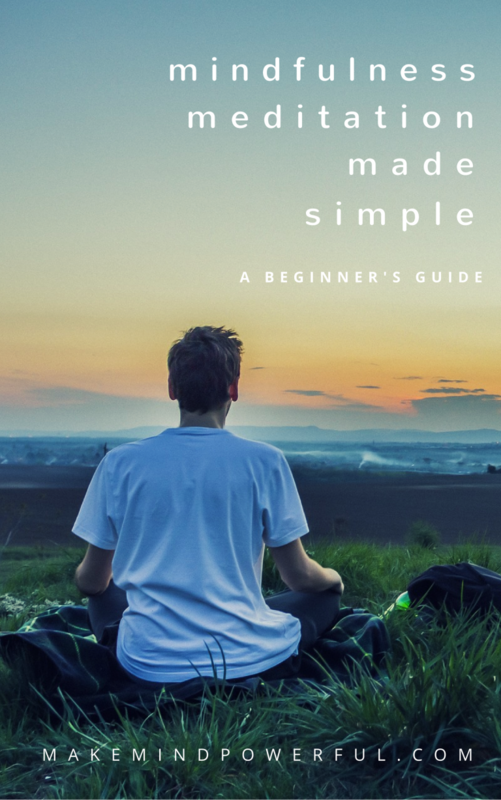 Great for sleep and relaxation. Green tea is made from the leaves of Camellia sinensis, the same plant that also produces black tea. The method of processing ultimately produces unoxidized greenish leaves. Green tea is believed to be native to China but has been cultivated in various countries around the world. It is no surprise that green tea has become a popular beverage, thanks to its numerous health benefits. Green tea contains L-Theanine, a type of amino acids that is responsible for the production of serotonin and GABA. A clinical study involving 34 adults that was prescribed with 200 mg L-Theanine shows a reduction in stress level. In its natural state, green tea contains caffeine that may disrupt your sleep cycle in spite of its stress-reducing properties. 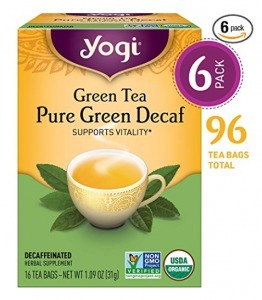 You can pick up the healthy habit of consuming green tea with this pack of decaffeinated green tea. The caffeine is removed in a natural manner to preserve the flavor and benefits of the green tea. As you take a sip of the tea, you’ll be rejuvenated by the subtle flavor that not only calms your mind but also improves your general wellness. Calms the mind and promote sleep. Some may dislike the taste. The pleasant scent and tiny purple flowers are unmistaken. Lavender (Lavandula angustifolia) is native to the Mediterranean and has been used by mankind for thousands of years for its medicinal quality. It is a highly popular herb for aromatherapy but a cup of lavender tea is equally calming. Besides its soothing quality, lavender tea has anti-inflammatory and anti-bacterial properties that can protect your health from external agents. There are many studies that have been conducted to ascertain the benefits of lavender and a suggested that it could positively affect sleep and anxiety. The perfect cup of lavender tea is made of pure organic lavender flowers from the fields of southern France, as offered by Feel Good Organics. 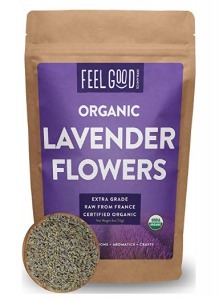 The dried lavender flowers are packed in a resealable pack and retain its therapeutic properties. These lavender flowers are culinary grade and can be used for tea. Just add 4 teaspoons of the flowers into 8 oz. of boiled water and let it steep for 10 minutes. The floral scent of lavender complements its taste to relax your mind after a long day. Organic lavender flowers from France. Packed in a resealable pouch. It’s easy to mistaken lemon balm for mint as they are closely related to each other and have a rather similar appearance and scent. Lemon balm was native to West Asia, North Africa, and Europe but thanks to its healing properties, is now grown around the world. 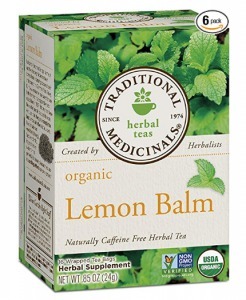 Lemon balm is known for its calming effect and other healing properties. The results of an open-label pilot study to evaluate the effect of lemon balm extract showed a reduction in anxiety and sleep-related disorders on 20 volunteers. You can enjoy the mild, lemon-scented aroma of lemon balm by infusing a sachet of caffeine-free lemon balm that was harvested from the German Rhine Valley. Each sachet contains 1,500 mg of lemon balm leaves that will help soothe your mind of stress and anxiety. Besides improving sleep quality, taking lemon balm tea also helps with indigestion issues. Making yourself a cup of lemon balm tea is easy. Pour 8 oz of boiled water onto a single sachet and allow it to steep for 5 minutes. Harvested from premium grade organic lemon balm. May not shows the desired effect for some individuals. Yogi Tea is a global brand that was founded in 1984. Its range of tea blends is inspired by Ayurvedic recipes that brought together potent herbs and naturally inspired flavors. Quality has always been at the forefront of Yogi Tea products and that makes it a recognizable brand amongst yoga and Ayurvedic practitioners. This bedtime tea is a harmonious blend of passionflower and chamomile with licorice, cardamom, and cinnamon that is carefully formulated to promote relaxation. The sweet and spicy aroma is pleasant to the taste, making it a great tea to unwind before bedtime. The blend is packed in compostable tea bags. The tea ingredients contain no caffeine, artificial sweeteners and is project-GMP verified. To enjoy the bedtime tea, you can add 1 or 2 tea bag into a cup of hot water, depending on your preference of the strength. Made of organic herbs and plants. Some buyers do not like the taste. 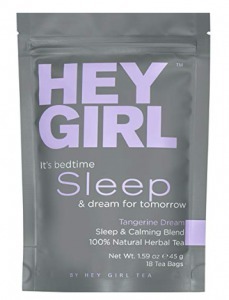 Hey Girl Tea is a relatively new online brand that offers various tea blends. Its bedtime herbal tea is meant for individuals who are struggling with stress, anxiety, and insomnia. The herbal tea is a proprietary blend that contains passion flower, chamomile, lemon balm, catnip herb, stevia leaf, and valerian root extract. You can put an end to the incessant tossing and turning in bed by drinking a cup of herbal tea prior to bedtime. Just steep one tea bag in a cup of hot water for 10 minutes and enjoy the drink. The synergy of the natural ingredients will calm your mind and ensure a deep slumber. With no artificial ingredients involved, you can drink the tea without worrying about habit-forming effects. The company has also shown remarkable customer service despite being a rather new brand. 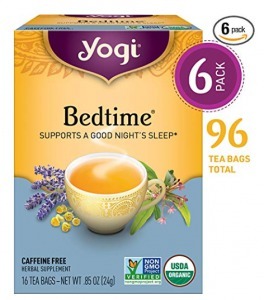 Great bedtime tea blend from natural ingredients. Highly effective for stress, anxiety, and insomnia. Organic India is a leading nutritional and wellness products company that source its ingredients from thousands of small family farmers in India. The company emphasizes organic and biodynamic agricultural practices and only sources from farms that are in compliance. 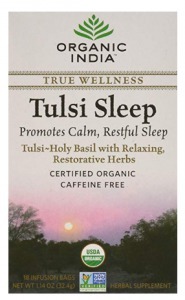 The organic tulsi blend includes tulsi or holy basil, cardamom, chamomile, peppermint, dwarf morning glory, ashwagandha, Gotu Kola, and stevia. The blend is certified organic by Control Union. By combining the ingredients, you’ll have the maximum effect that promotes relaxation and sleep. Steep a single tea bag with 250 ml in a cup and drink it prior to bedtime to ensure that restless thoughts no longer trouble you as you get the sleep you needed. Besides, the infusion also helps to boost your immune system and increases your stamina. Celestial Seasonings was founded in 1969, with some of the first teas sold in hand-sewn muslin bags. Today, the company has sold over 1.6 billion cups of tea a year with no signs of slowing down. It sourced only the finest tea leaves and ingredients from around the world. This Sleepytime herbal tea is a balanced blend of chamomile, spearmint, lemongrass, tilia flowers, blackberry leaves, orange blossoms, hawthorn, and rosebuds. It is free of caffeine and gluten-free. No artificial flavors or preservatives are added to the tea which making the tea a perfect gift from nature. 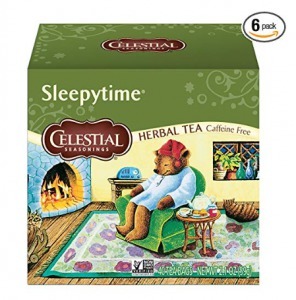 A cup of sleepytime herbal tea is perfect to end the day with. All you need to do is to steep one tea bag in hot water for 6 minutes and enjoy the mild, pleasant aroma. In fact, it’s a perfect tea to include in your nighttime ritual. A balanced blend of natural ingredients. With more than 300 years of history, Twinnings is a renowned tea maker in the world. A business that started from a storefront in London has turned into a globally recognized brand that ships to 100 countries. The Nightly Calm tea is made from a blend of chamomile, spearmint, lemongrass, linden, orange leaves, orange blossom, lemon myrtle, rosebuds, hawthorn berries and enhanced with natural spearmint flavor. No artificial ingredients are added to the tea. The herbs and plants are sourced from reputable growers around the world that produce the finest harvest. The leaves are carefully selected to ensure each pack of herbal tea is top quality. The result is a cup of tea with a soothing aroma and mellow taste that relax the mind for a rejuvenating sleep. Natural blend of finest ingredients. Helps to get a restful sleep. Some individuals prefer a stronger taste. I hope that some of the suggestions work in ending your sleep issues. If you’re overwhelmed by the choice, I’ll recommend chamomile as a start. Personally, chamomile is my top favorite.